As a young man, Clay Billings participated in barrel racing, pole bending and breakaway calf roping. But his dream was to compete with the “men” in tie-down calf roping. 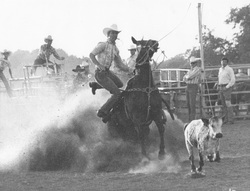 Clay started with winning his first important title – the tie-down championship at the Medina Future Farmers of America Rodeo in 1975. A month later, he became the state high school calf-roping champion. Later that same year, he became the national champion of tie-down calf roping, joining a growing line of champions from Bandera County.